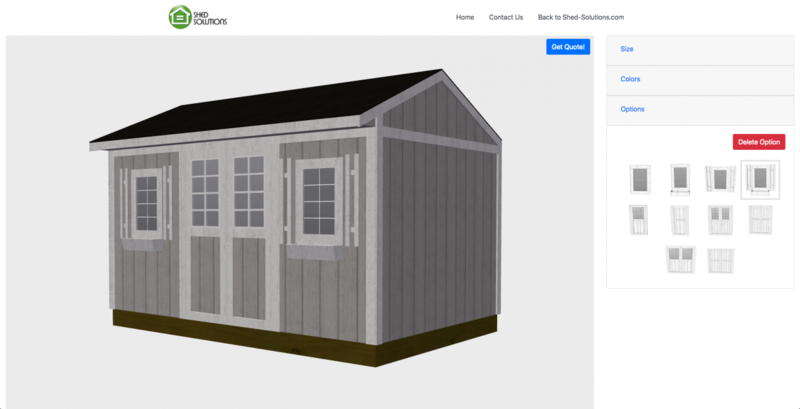 Try our new interactive 3D Shed Builder by clicking here! At Shed Solutions we have always prided ourselves on being a leader in the shed manufacturing industry by providing our clients with all the necessary tools and information for their new garden shed. Today we are proud to launch our new interactive 3D Shed Builder platform. You can now design you shed directly on our website using this new innovative software. The platform includes all of our product lines and shed styles. Start by selecting your desired product line and shed style. Then select the size of shed. Now it’s time for the magic to happen! Start adding Door(s), and Window(s) and explore the many standard colour combinations available for your new garden shed. The options and configurations are endless! This entry was posted in Featured Shed Of The Week, News. Bookmark the permalink.